With great trepidation we, the assembled editorial team of The Sneer Review, are proud to announce the greatest advance in the practical exposition of religious knowledge since the invention of the printing press – the Metaphorical Illuminator. For many years, despite the many advances made possible by the increase in human knowledge since the enlightenment, the role and value of religion has remained a contentious point for one reason: the lack of a means of distinguishing within scriptural texts, the historical facts from the poetic metaphors. While practically every religious group agrees, amongst their own brethren, at least, that their sacred book contains both literal fact and non-literal metaphor, their existed no agreed methodology to tell which was which. Many of the great schisms of the major faiths could have been avoided if only they had what is now in our possession – the ‘Metaphorical Illuminator’. The Illuminator, the culmination of ten years of dedicated work by the Sneer Review Theological Institute (kindly supported by a grant from the Templetown foundation), at last provides a foolproof mechanism to determine which parts of a holy scripture are possibly historical and which are definitely metaphorical. 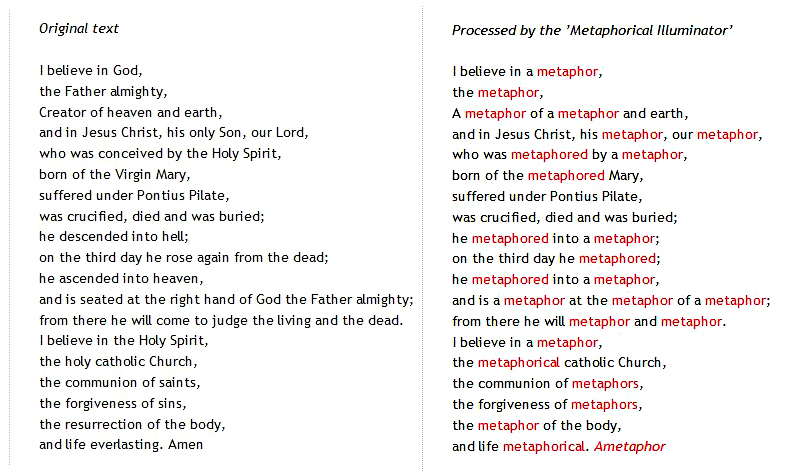 As a demonstration of the power of the Metaphorical Illuminator we have now processed the most important scriptural text of Roman Catholicism, the worlds largest Christian denomination – namely the Nicene, or Apostle’s Creed - revealing once and for all the historical and poetic aspects to the primary statement of faith of this religion.